I hate food waste. Now I’m sure we ALL hate food waste, but for some reason it’s a deep-seated hatred for me. I’m not sure where such strong feelings originate – I never recall going hungry a day in my life. But for some reason I simply cannot stand food waste. I keep an eye on food freshness in my kitchen like a ninja! I’ve spoken before about my Cook-Once, Eat-Twice method of cooking where you cook a boatload of main dish & freeze the rest for future meals. These entrees will be served exactly as they were cooked. Homemade Meat Ravioli or Stuffed Bell Peppers are two examples. But there’s another method of cooking I often employ to stop food waste in its tracks: Planned Leftovers. This is a little different, a main ingredient is made in large quantities and then the leftovers are made into completely different dishes. For instance I might cook a Slow-Cooker Sticky-Chicken one night and then make Tortilla Soup with the leftover chicken. Make sense? Now hear this: recently I purposely made massive quantities of pork roast. 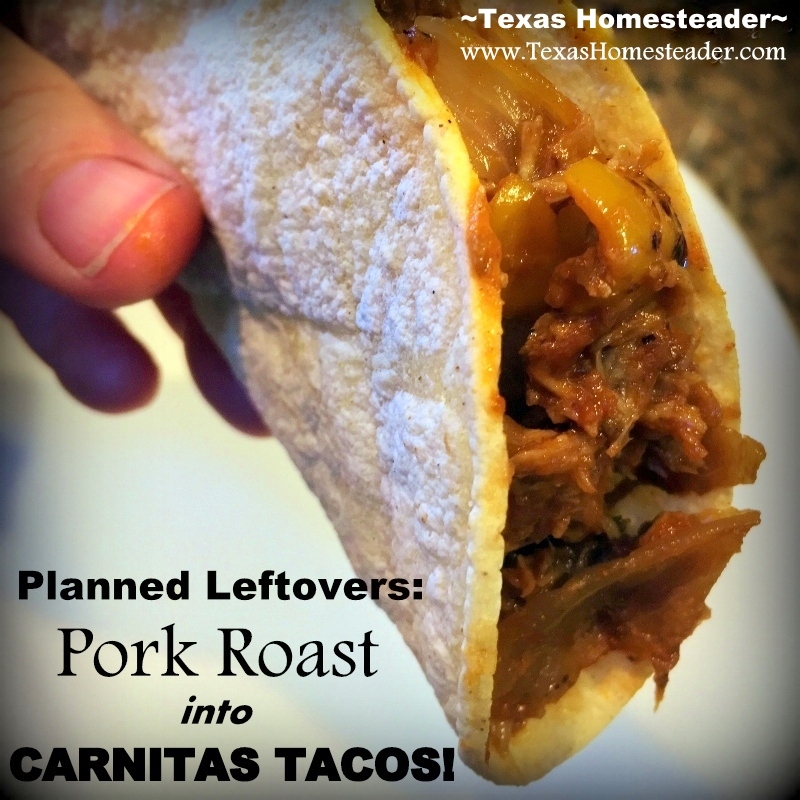 One of my all-time favorite leftovers planning is Carnitas Tacos. Oh man you’re gonna love this! 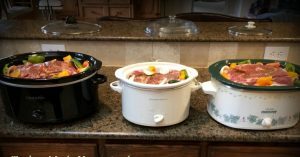 I had a huge amount of pork roast to cook so I pulled out all THREE of my slow cookers! I have a normal-sized one, a large one and a mammoth-sized one & it took all three to cook this much Pork Roast. Of course for that night’s supper RancherMan & I enjoyed roast with potatoes & carrots. But I’ve got big plans for all that leftover pork – oh yes indeed! 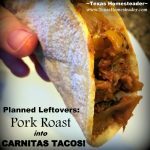 I’ve made pulled-pork enchiladas and even a Meaty Stew with the leftovers but today I’ll talk about my favorite meal remake – CARNITAS TACOS! Now since I knew beforehand that I was planning this leftover meal with my pork roast I was sure to toss in plenty of extra onions & bell peppers. That way they can cook right alongside my pork roast. When I was storing the leftovers in the fridge I placed the roast in one huge container and all the leftover veggies in a separate container. But now it’s time to whip up those Carnitas Tacos and this simple prep work means it’ll be done in a flash! First I take out almost all the leftover bell pepper & onion and mash it into almost a paste consistency. 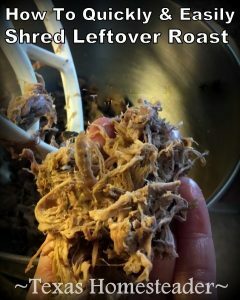 (I reserve a small amount of each so that I can add that delightful texture in my taco meat) Then I bring out about 3 cups of cooked roast and toss it into my pan. It’s easier to shred when it’s warm. After it heats just a short time I use my KitchenAid mixer to quickly shred the meat. Then I add about 1/2 cup tomato-based sauce. Now you know I’m a ‘Use Whatcha Got’ kinda gal, so sometimes it’s just tomato sauce, sometimes it’s my Roasted Tomato Puree. And sometimes it’s salsa or a mixture of salsa & salsa verde. It all depends upon what I have that needs to be used. (See note about food-waste hatred above!) Then I add my seasonings – a teaspoon each of chili powder, cumin & paprika. 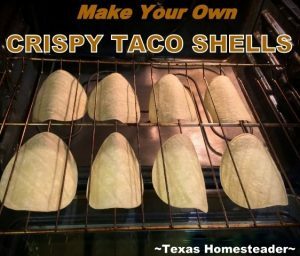 So I’ve started making my own Crispy Taco Shells. Not only are they cheaper but they’re fresh and lightly crispy, not hard like the commercial ones. Oh, and they stay together when you bite them unlike the commercially-purchased crispy shells of my past that would crumble with each bite. I really can’t say enough about my homemade version. Give ’em a try! UPDATE: I’ve started making my own corn tortillas so I gave them a try with this crispy taco shell procedure too! They worked perfectly! And with so few ingredients, why not make your own tortillas?? Anyway, after my taco shells are ready, the meat mixture is hot & ready too. I simply call RancherMan to the table for supper. Oh make no mistake the calling is easy, he’s been hovering around the kitchen licking his lips all along! We take a couple of crispy shells and fill ’em to our heart’s desire with the Carnitas Taco meat. Typically that’s all it needs for us – no lettuce or cheese. No sauce of any kind. Just plain, simple, delicious Carnitas Tacos. Of course you can add those garnishments if you like. And since I’ve made them from my planned leftovers I’ve been able to turn extra leftover pork roast into a brand new and totally delicious meal in a snap. No food wasted here! What do you do with that leftover pork roast after supper tonight? Plan on using it another night for CARNITAS TACOS! Planned leftovers at its finest. In a large pan, add roast, heat slightly and shred with 2 forks. Add the chopped cooked onions & peppers, the salsa (or tomato sauce) and 1 tsp each of chili powder, cumin & paprika. Heat gently until heated through. Add meat mixture to either corn or flour tortillas, or make your own crispy corn tortilla shells. 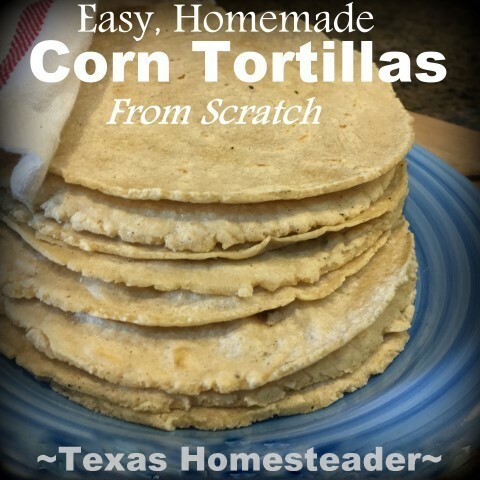 This entry was posted in Blog Posts and tagged Cooking, Frugality on February 19, 2017 by Texas Homesteader. 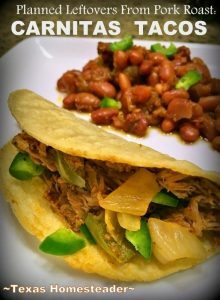 These carnita tacos sound great! Great idea on cooking it all at once and then freezing for later; I bet that’s a real time saver. I hate food waste as well! Thank you for sharing your recipe with us using leftovers. It is great to have you link up at #OvertheMoon Link Party this week. I’ve pinned and shared. These look so delicious! I can’t wait to try it. Thanks for joining our little party! These tacos sound delicious! (I like leftover turkey for tacos.) Thanks for sharing the recipe! Sure does look delicious. Never thought about having tacos with leftovers. We always had pulled pork sandwiches. Tacos will be a great change. Thank U.